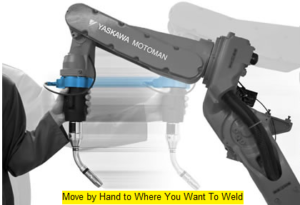 Simplified programming and reduced set-up times by manually guiding the robot to locations and using an ICON based menu to program welding tasks. Enables job shops to easily implement robotic welding and secures a quick return on investment with high mix, low volume batch runs. Different motion response and speeds are selectable to easily move between course positioning and fine positioning next to the part.